The new installment of the Noni Trunk show has arrived! Come see the Harlequin Pillbox, srping basket, Lattice bag, the large adventure bag (the biggest bag I’ve ever seen!) and a few other fabulous Noni surprises. Just in time for this installment of the trunk show we also received our Lacis purse handles. These are the handles Noni uses in some of her designs. These silver, bronze and gold metal handles are both elegant and functional. 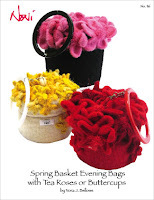 They add a bit of finesse and class to felted purses. One of the best features of these already fabulous handles is the removable rod, which means you only need one purse handle for several bags of the same style! Brilliant!